Looking south from Downtown Rio Dell at the Eagle Prairie Bridge spanning the Eel River. Photo taken 05/29/06. 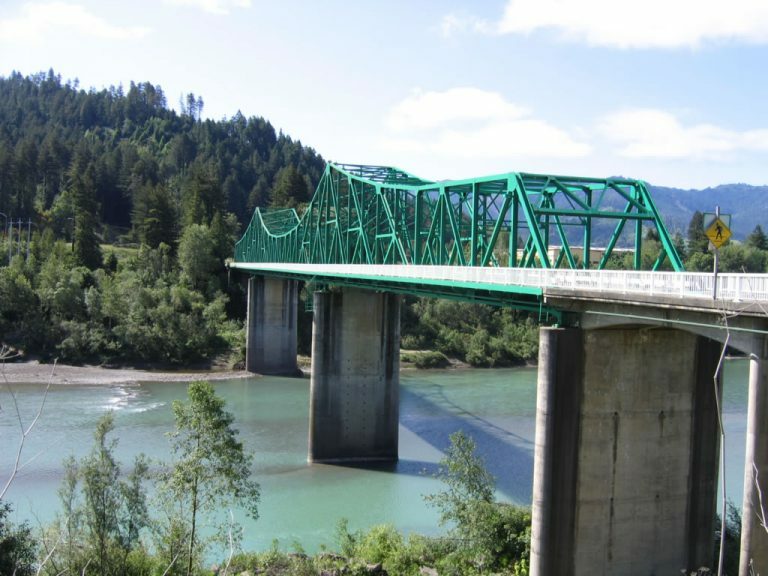 California 283 is the old U.S. 101 bridge over the Eel River between Scotia and Rio Dell in Humboldt County. It is also designated as part of Business U.S. 101 through Rio Dell. With a distance of approximately a third of a mile, According to signs on California 153, the honors for shortest state route go to California 153 at Marshall Gold Discovery State Historic Park. However, California 283 may be shorter than California 153. Perhaps California 153 is the shortest signed state route? There is at least one shield for California 153, but there are none for California 283 (except one bridge identification sign at the south end of the Eagle Prairie Bridge). Leading away from U.S. 101 (Redwood Highway) at Exit 679, U.S. 101 Business and California 283 travel north toward the Prairie Eagle Bridge over the Eel River. Photo taken 05/29/06. Continuing north along Main Street north of Scotia, the road narrows substantially to cross the 1940-built span across the Eel River. Photos taken 05/29/06. The only reference for California 283 is this bridge identification marker at post mile 0.12. Photo taken 05/29/06. The Eagle Prairie Bridge over the Eel River survived the devastating floods of 1964. A small plaque identifies the manufacturer of Judson Pacific Co. Photo taken 05/29/06. Views from the pedestrian walkway along the east side of the Eagle Prairie Bridge. Photos taken 05/29/06. The city of Rio Dell, known as the "Warm Hearted City," sits on a bend of the Eel River adjacent to the Scotia Bluffs. The estimated 2016 population of Rio Dell is 3,408 people. Photo taken 05/29/06. SR 283 concludes where the painted center line ends on Wildwood Avenue. Unsigned U.S. 101 Business continues north into Downtown Rio Dell and back to U.S. 101 at Exit 681. Photo taken 05/29/06. U.S. 101 Business departs from U.S. 101 at Exit 681 and follows Wildwood Avenue as an unsigned route into Rio Dell. Photo taken 05/29/06. Rio Dell welcome sign posted along Wildwood Avenue south of U.S. 101. First settled by Lorenzo Painter in the 1870s, the city of Rio Dell was incorporated in 1965. Photo taken 05/29/06. Wildwood Avenue begins as a divided highway with one lane in each direction. A meandering sidewalk parallels the old alignment. There are no reassurance shields for Business U.S. 101 south. Photo taken 05/29/06. Downtown Rio Dell comes into view as Wildwood Avenue continues south. The city of Rio Dell consists of three main communities: Belleview to the northwest, Eagle Prairie west of Downtown, and Wildwood at Downtown. Photo taken 05/29/06. U.S. 101 Business (Wildwood Avenue) approaches the Eagle Prairie Bridge over the Eel River. State maintenance begins at the painted center line. Photos taken 05/29/06. The Eagle Prairie Bridge carried U.S. 101 through Rio Dell until the bridge was bypassed with the modern freeway alignment in 1976. Today the bridge carries a fraction of the traffic, but it remains of importance for connecting Rio Dell with Scotia to the south. Photo taken 05/29/06. Built in 1940, the Eagle Prairie bridge over the Eel River survived the catastrophic floods of 1964. Photo taken 05/29/06. Looking west from the Eagle Prairie Bridge, the scenic Eel River finds its way between Rio Dell and Scotia. Photo taken 05/29/06. Pedestrian walkways parallel both sides of the steel truss bridge over the Eel River. Photos taken 05/29/06. The two-lane northern approach features sidewalks on both sides of California 283. Photo taken 05/29/06. Main Street extends south from the Eagle Prairie Bridge along side the diamond interchange (Exit 679) linking SR 283 and U.S. 101 Business with the U.S. 101 freeway. Photos taken 05/29/06. California 283 ends via the access road linking Main Street (old U.S. 101) with the adjacent freeway. U.S. 101 travels north to Eureka and south to Ukiah and San Francisco. Main Street continues into the company town of Scotia, which is privately owned. Photo taken 05/29/06.